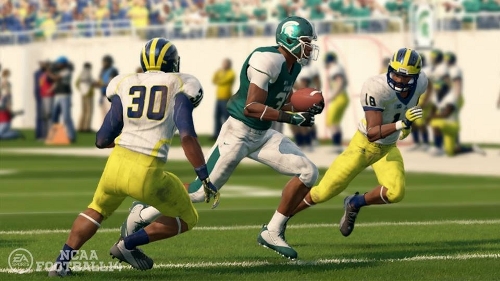 On Thursday judge Claudia Wilken heard arguments from both sides in the player likeness lawsuit that threatens the future operations of the NCAA, CLC, and Electronic Arts. A ruling is not expected for some time – it could be a matter of weeks or even months. Questioning from the judge certainly appeared tougher on the plaintiffs. Wilken even told the lawyers that they must add a current college player to the case now if any are to end up in the class action suit later. That could be a difficult proposition as most athletes would not want to be singled out in such a manner while they continue their athletic competition and education. The certification has been viewed as difficult for the plaintiffs to succeed in but if they did it would be a crushing blow that could lead to a settlement rather than going to trial. The NCAA contends the claims of athletes vary from individual to individual who would value their worth differently – there isn’t the required commonality – and because of that it should not be class action. If the certification request is denied it would be a huge win for the defendants who would only have to battle individual lawsuits rather than a pool of thousands and the monumental payout and changes that would have to be made going forward if the end result was not in their favor. Interesting that judge is asking about stars vs. benchwarmers. One of the tests for class certification is commonality. Judge questioning plaintiffs as to the potential conflict of star athletes negotiating for bigger share of revenue than benchwarmers. That last RT is a telling statement. The NCAA and EA are not on the same team. Not good for NCAA. Significant moment. Judge asks plaintiffs why they have no current student as a named plaintiff to represent the class. Attorney for plaintiffs says they could use a current student but fear retaliation by NCAA, want to discuss in private. Judge skeptical. O'Bannon's lawyer says he wants athletes to be allowed to negotiate w. schools and video game companies. "That would be the marketplace"
Judge suggests if a jury did not accept plaintiffs' plan of equal revenue for every athlete, the class would have to be decertified. The discovery of Tim Tebow’s name being in NCAA Football 10 could throw another wrench into EA’s series of arguments. Depositions from former Alabama wide receiver Tyrone Prothro and UConn basketball guard Tate George support the defendant’s reasoning for denying class action certification.